Swingshift Big Band, directed by saxophonist Phil Shotton, swung into life in 2000. It has gained an excellent reputation for being a versatile, dedicated, well-rehearsed and fun band! 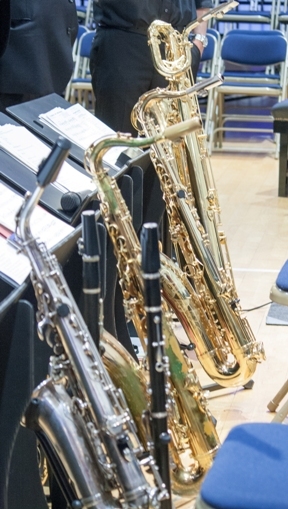 Swingshift Big Band is based in Ormskirk, Lancashire, and regularly play at big band and jazz clubs around the UK. We perform a varied selection of big band music from the great jazz libraries, including; Glenn Miller, Frank Sinatra, Count Basie, Duke Ellington, Maynard Ferguson, James Morrison, and Gordon Goodwin . . . to name but a few! Check our gig list for details of when and where you can hear us. We are available for public, private or corporate bookings, and can provide bespoke big band packages for your event. Ideal for parties, weddings, theme nights, and charity concerts, we understand that every occasion is different and personal to you and can adapt to fit your event perfectly. For more information, or to enquire about booking the band, please contact us. There is nothing like the experience of a live 17 piece big band fronted by a great singer, and we regularly work with a fabulous singer, Chris James, who has an extraordinary voice, an immense talent and a real mastery of the classics. We recently went to Parr Street Studios, Liverpool, with Chris to record some tracks - check our audio page for a few samples which were recorded. Swingshift Big Band is held in high regard among many of the best jazz performers on the UK scene today. Swingshift has performed in many national and international Jazz festivals, plyed specially commissioned compositions, and taken part in various exciting jazz projects and recreations of rare and lesser heard repertoire. In 2012 Swingshift Big Band toured Northern Ireland with Singer, Songwriter and Saxophonist AJ Brown and since then have continued an enjoyable musical partnership, staging performances together across the country. Swingshift have a fantastic line up of energetic and highly accomplished musicians, to learn more about them click here.